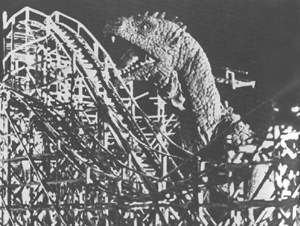 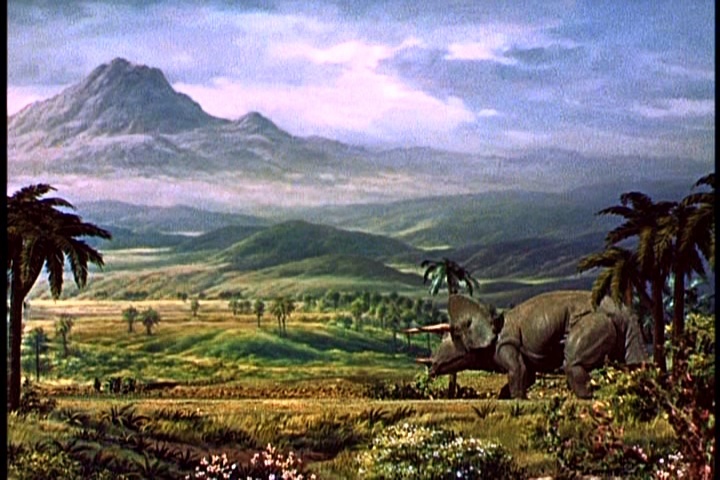 This page is dedicated to matte paintings and miniatures at the movies of Ray Harryhausen, master of stop-motion animation. 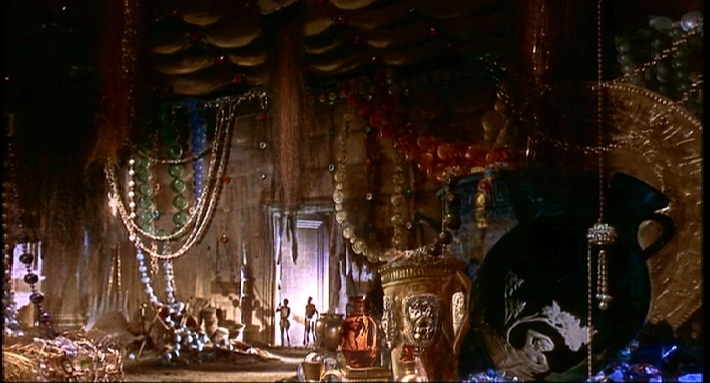 Harryhausen himself made some glass paintings for his earlier movies. 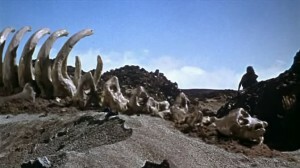 A good example could be his abandoned personal project of “Evolution”. He was a great painter and illustrator, and probably could have become a really good matte painter but he focused his career on Stop-motion animation. 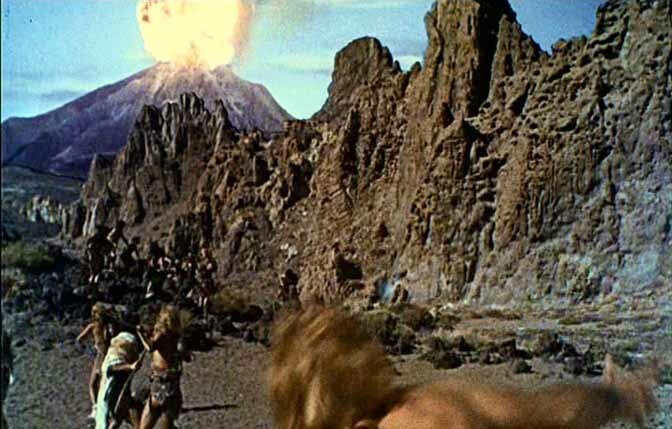 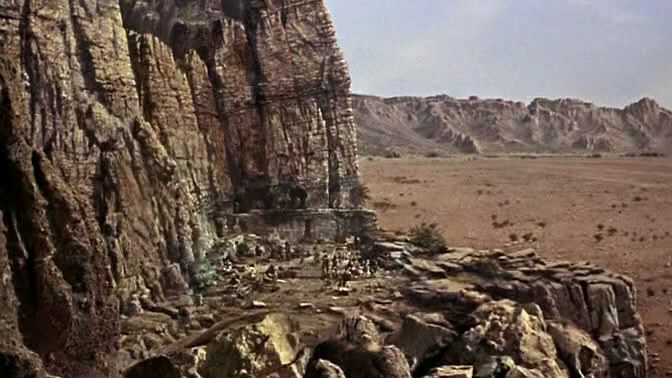 As far as I know, the only movie in which there was a matte painter credited was “Clash of the Titans”(1980) where Cliff Culley was responsible for supervising the miniatures and matte paintings. 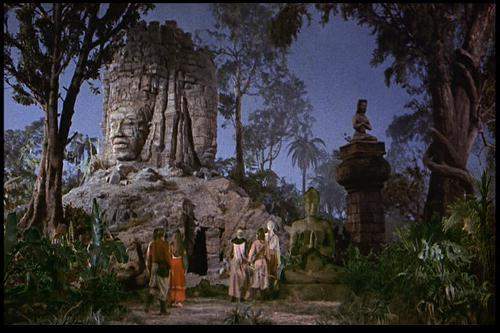 The rest of the matte painters that contributed to Harryhausen films were uncredited, like Les Bowie, a matte painter who became all around FX master. At Les Bowie matte department were Ray Caple and Bob Cuff. 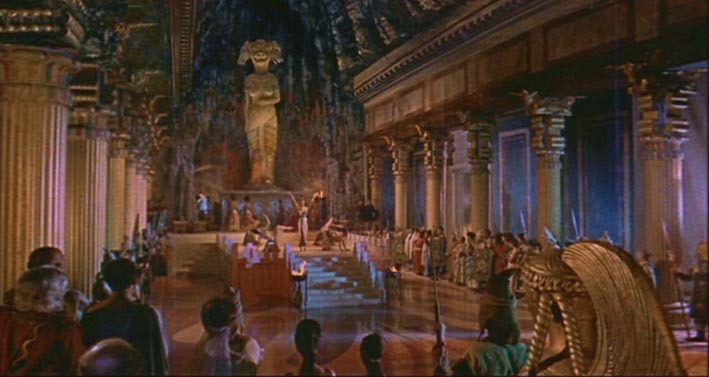 Harryhausen didn’t use matte paintings always; he favored also the use of model miniatures which were matted into the live action set. 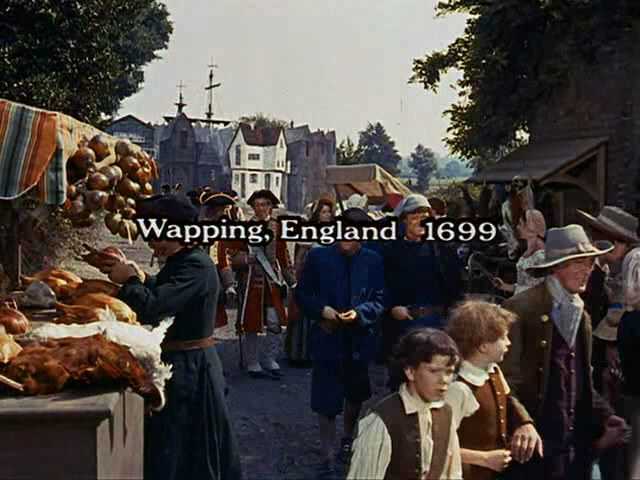 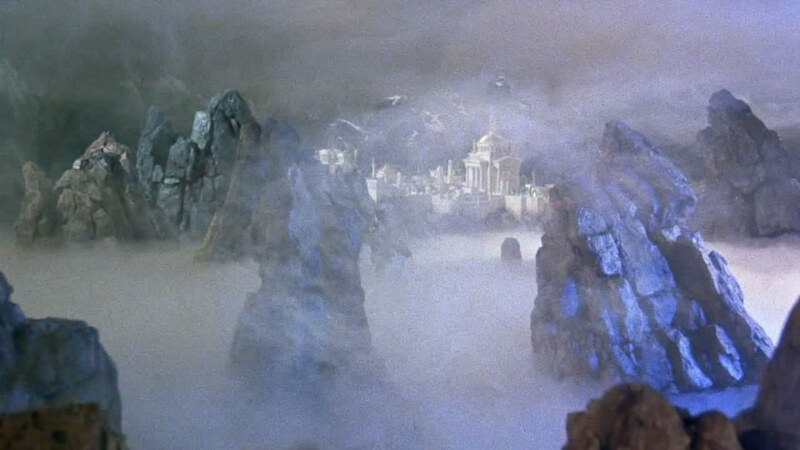 Most of the optical effects were done at England, at Shepperton Studios where they create some miniatures and matte paintings. 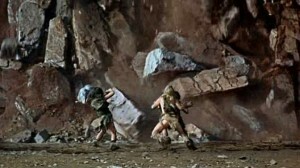 During the 50´s and 60´s Wally Weevers was head of the visual effects department at Shepperton, and among his collaborators where matte artists like, Bob Cuff, George Samuels, Gerald Larn or Doug Ferris. 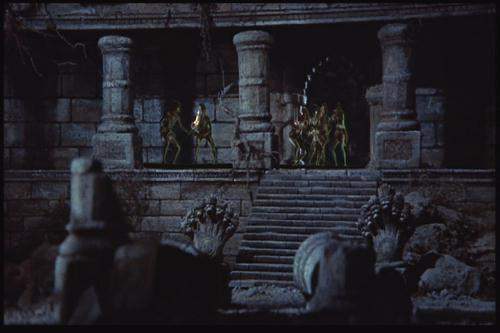 Some of the Harryhausen movies where filmed on Spain, and among his Spanish collaborators were Emilio Ruiz del Rio who painted some glass shot on location, and Francisco Prosper, constructor coordinator in charge also of building model miniatures. 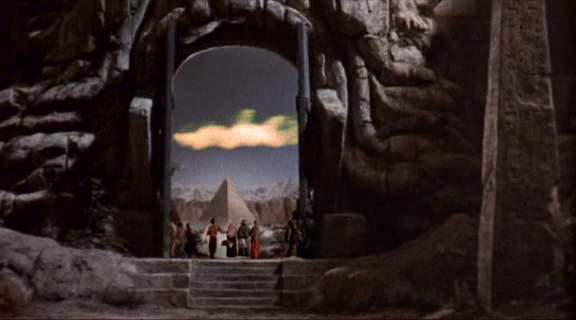 I have been able to give credit to some artist thanks to the collaboration of professionals like Bob Cuff, Gerald Larn, John Grant, Doug Ferris or Emilio Ruiz, to whom I’m very thankful. 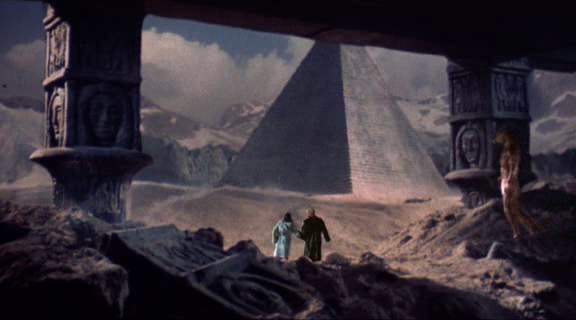 Based on a story by Ray Bradbury. 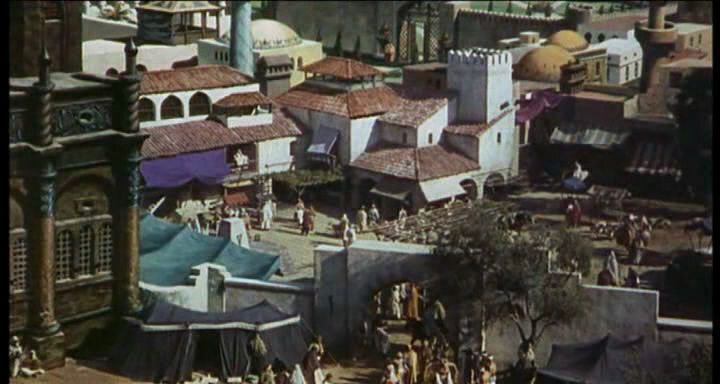 Lots of miniatures but not a single matte painting, as far as I know. 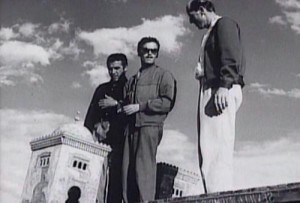 Director Eugene Lourie was art director and FX expert. 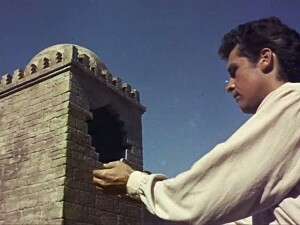 He used hanging miniatures very often. 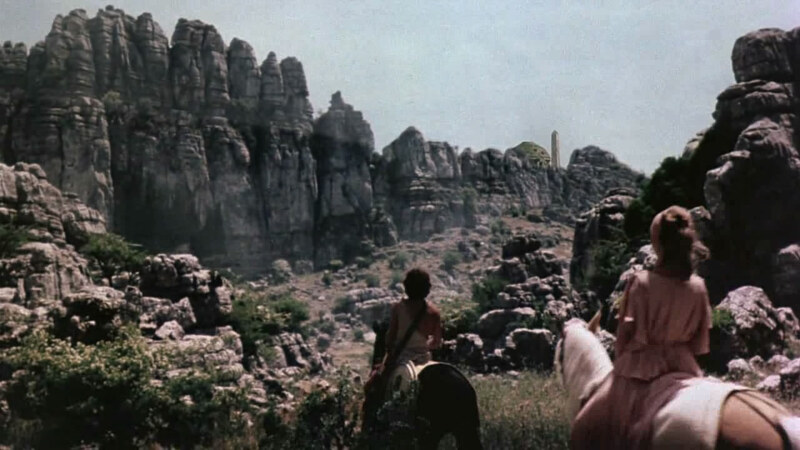 He didn’t favor the use of matte paintings. 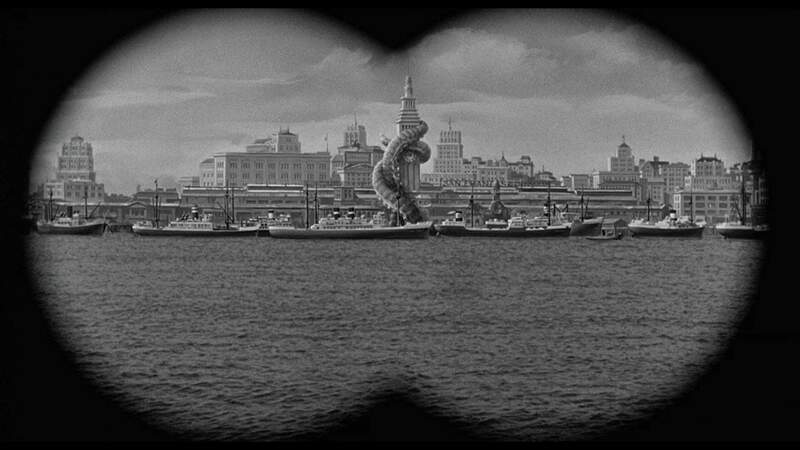 There is an uncredited matte painting for a long view of San Francisco harbor. 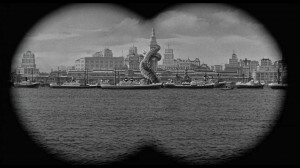 The tentacles creature was also painted. 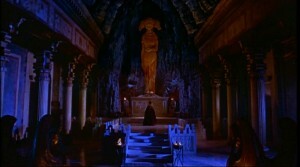 Jack Erickson was the FX supervisor for Columbia films. 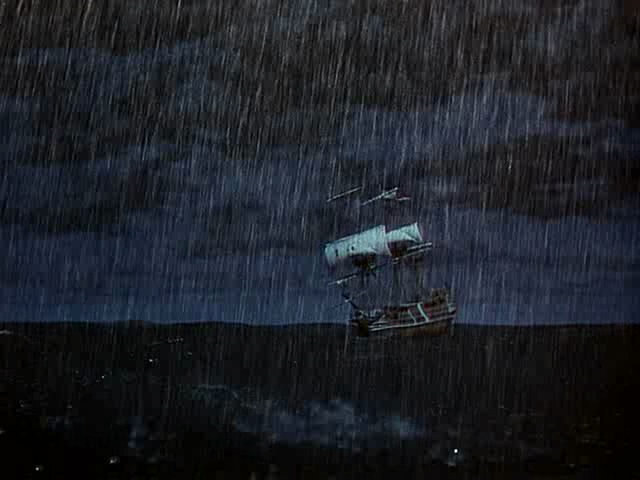 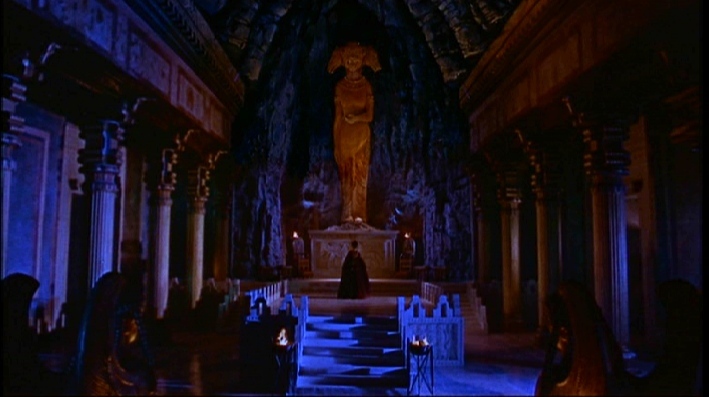 There were not matte painters credited at Columbia films. They probably hired a freelance artist for the matte work. Film Editors: Edwin Bryant, A.C.E. ; Jerome Thoms, A.C.E. 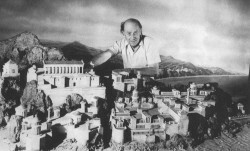 Miniatures made in London under Harryhausen supervision. 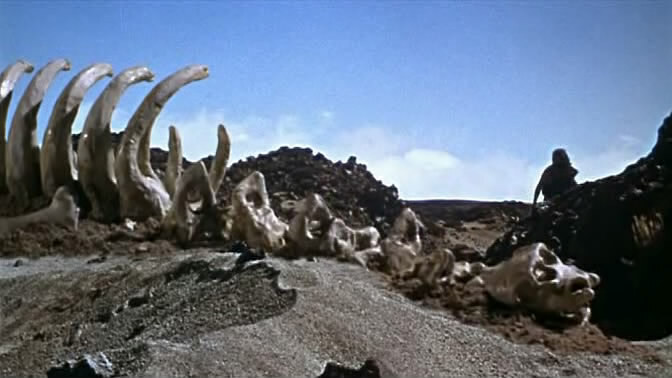 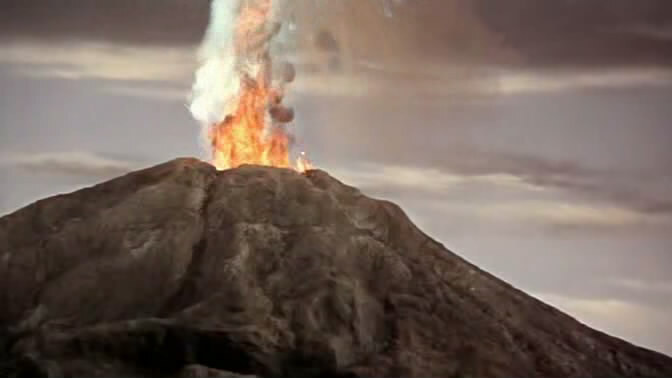 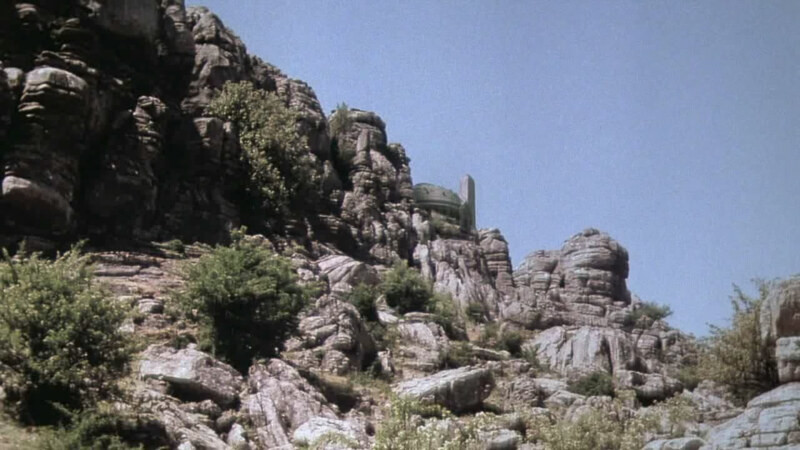 Matte painting shots were stock footage by other films. 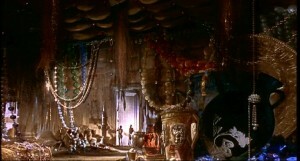 There were not mattes originally painted for that film. 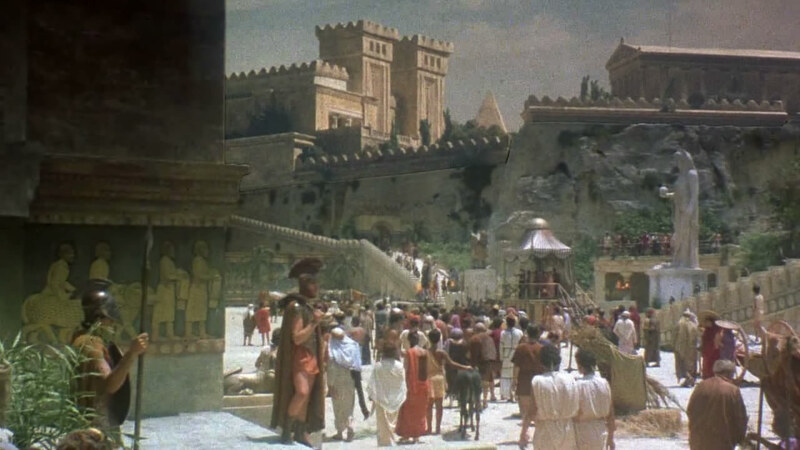 This matte painting of Baghdad was not originally made for the Harryhausen film The 7th Voyage of Sinbad by Columbia Pictures. 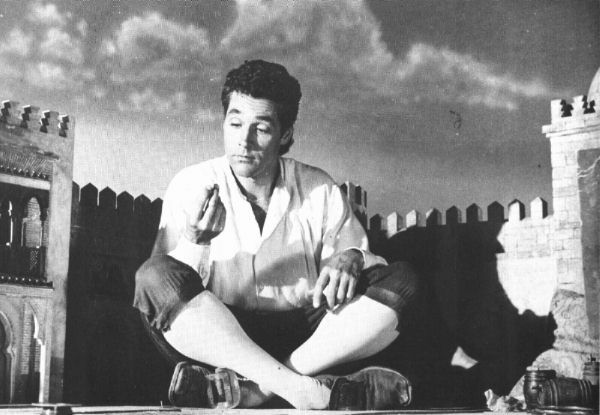 On his biography book, Ray didn’t remember from what film it was taken. 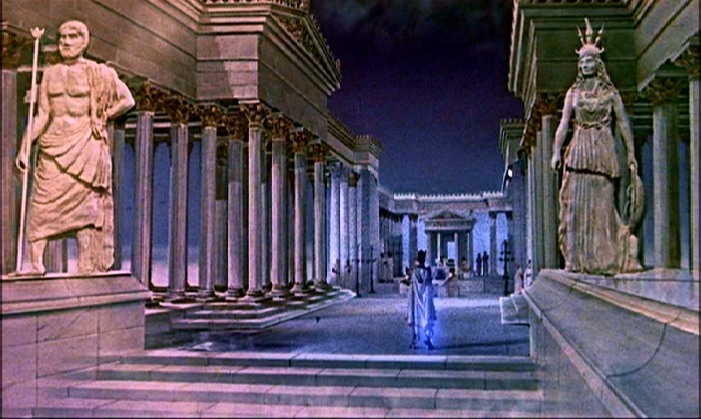 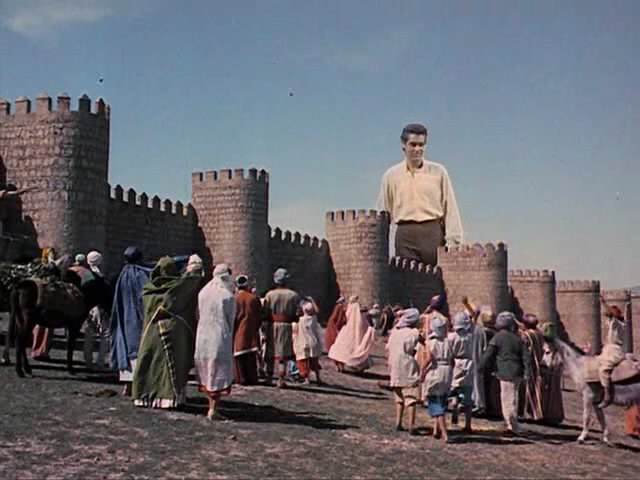 It was a Universal film “The veils of Baghdad” (1953) Probably the matte painting was from Russell Lawson head of Universal matte department at that time. 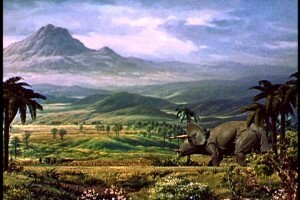 Scenic artist: Emilio Ruiz del Rio. Some of the miniature work was done at Spain by Francisco Prosper team to be used during the filming. 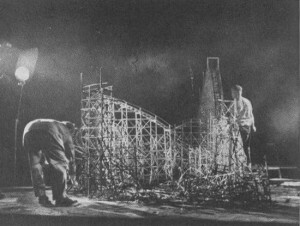 Some other models were built during postproduction at London. There is a matte shot that could be painting or a miniature matted in. 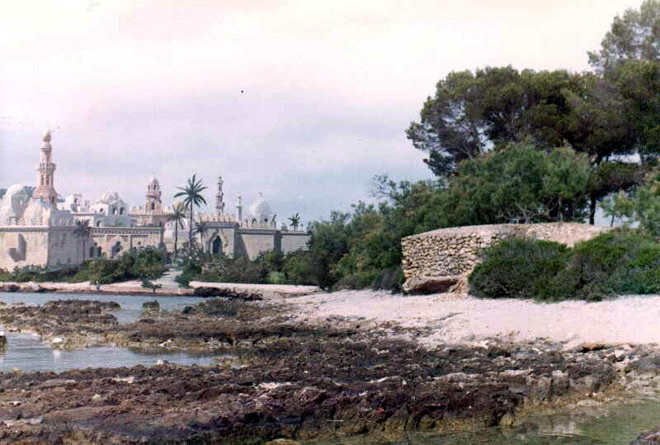 Three images of the miniatures built in Spain. 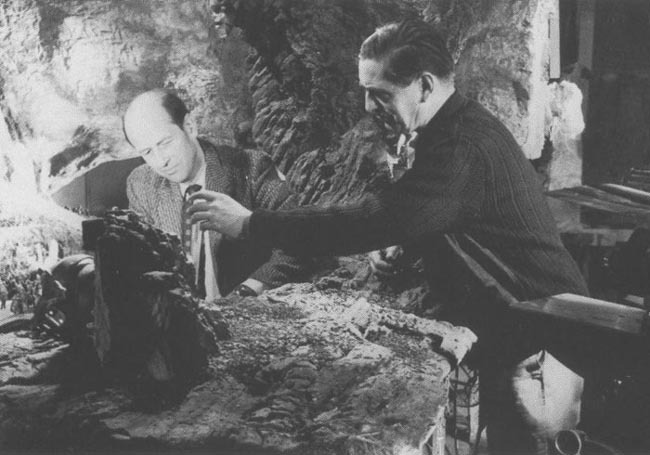 With Harryhausen is art director Gil Parrondo. Alan Maley and Ivor Beddoes they worked freelance for Shepperton Studios at that time, so maybe they also contributed. Miniatures were built at Shepperton studios. 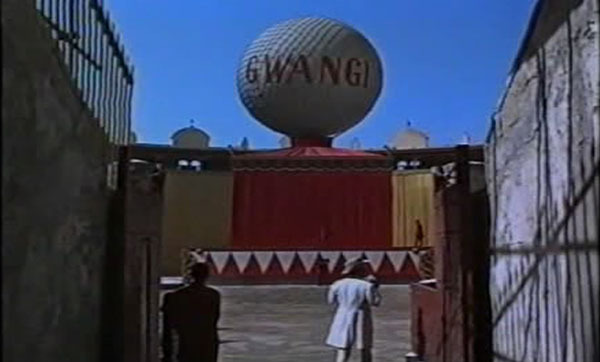 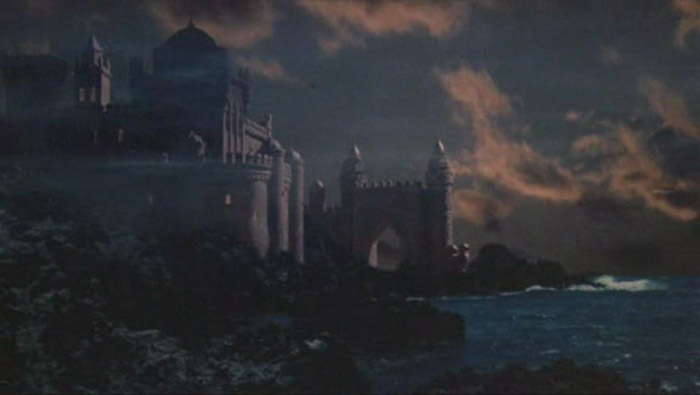 Also, the matte paintings were done by Shepperton matte department with Wally Veevers supervision. British matte artists Bob Cuff worked on those paintings. 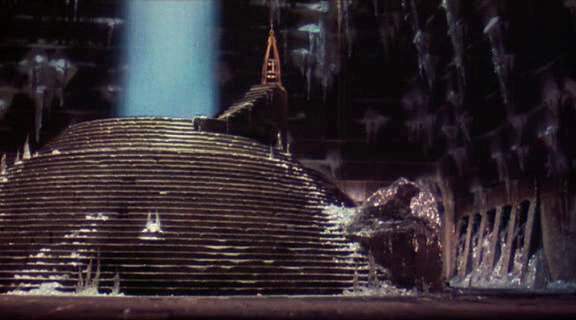 Some miniatures were also built in Spain by Francisco Prosper like the Nautilus cave. 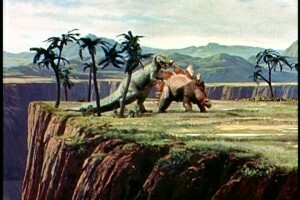 The black and white illustrations are the work of Harryhausen. 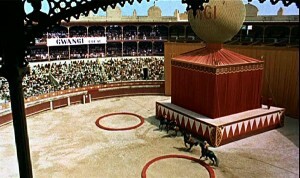 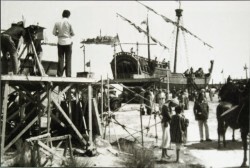 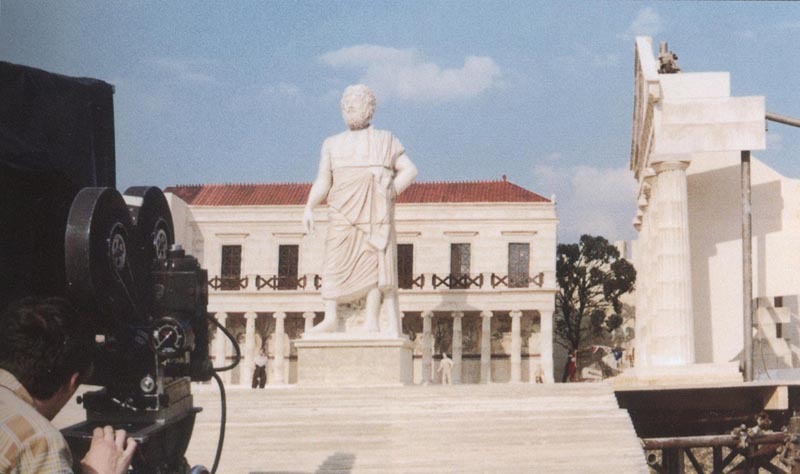 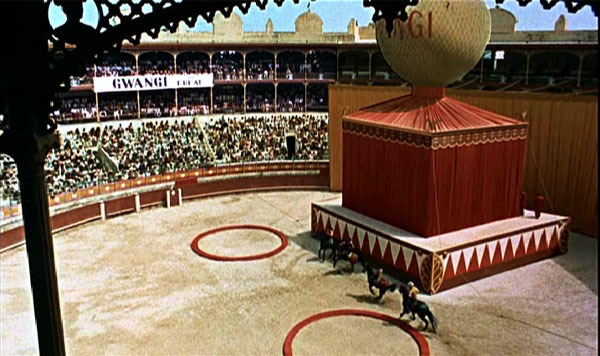 Matte painting at left, and filming the set built at the location in Spain at right. Miniature built in Shepperton studios. 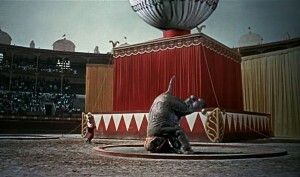 Ray with the balloon miniature. 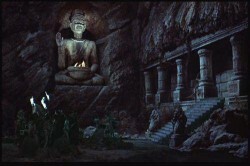 Nautilus cave and Volcano miniatures built in Spain. Mattes and miniatures were done at postproduction again at Shepperton matte department under Wally Veevers. 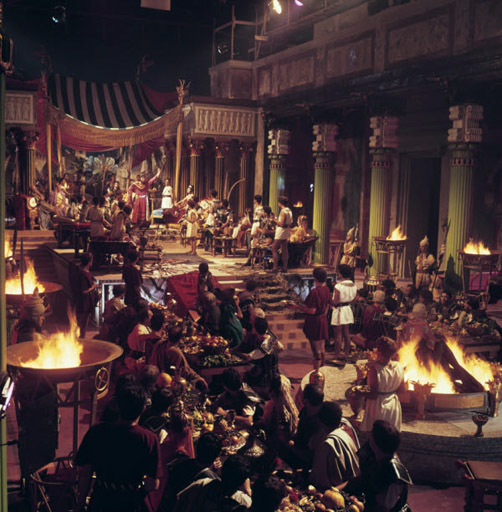 Bob Cuff was one of the matte painters on that show. 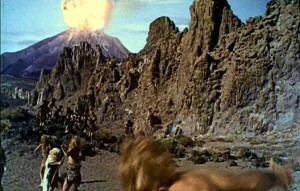 Les Bowie contributed also with some FX and miniatures. 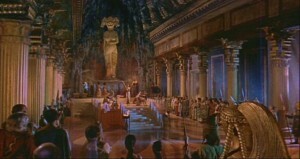 The set of the Temple without the matte. 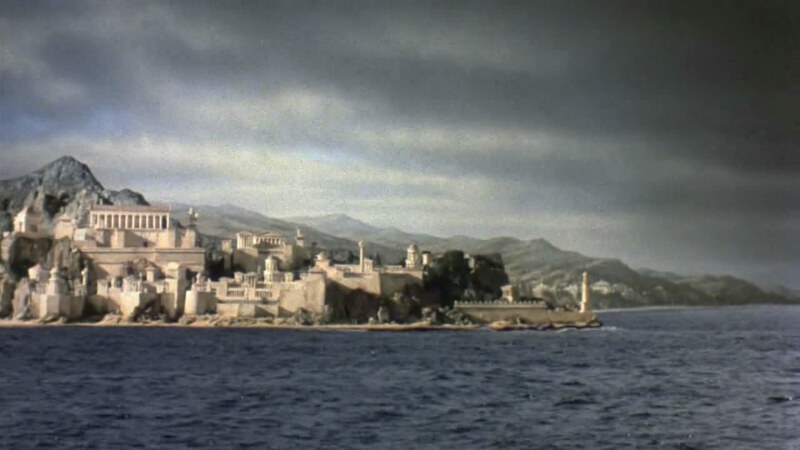 Matte painting & miniatures: Les Bowie Company, with Ray Caple and Bob Cuff. 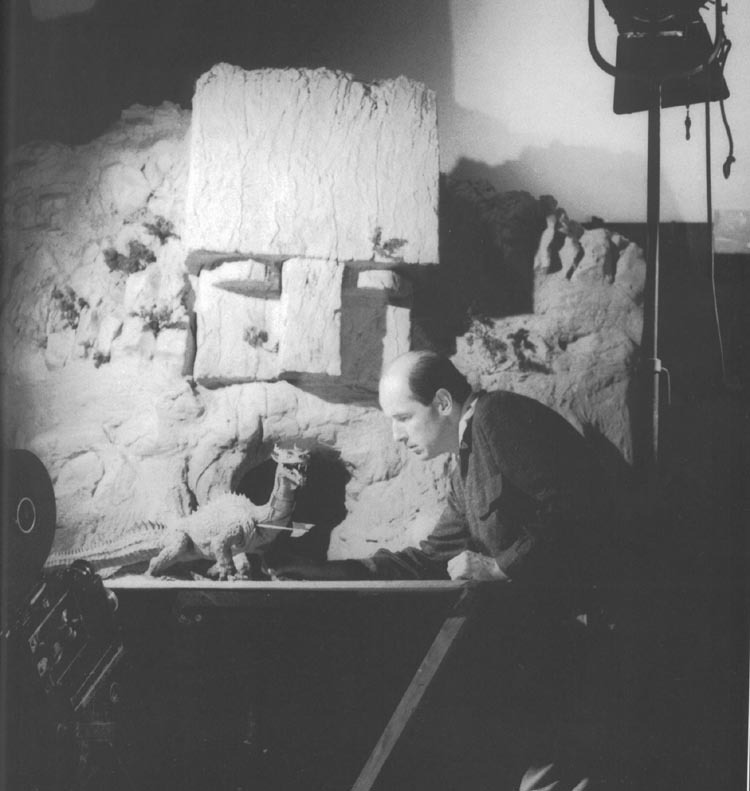 Text explanations by the book: Ray Harryhausen, an animated life. Matte paintings and miniatures were done by Les Bowie company. 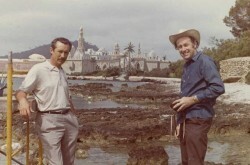 Ray Caple and Bob Cuff in charge of matte paintings. 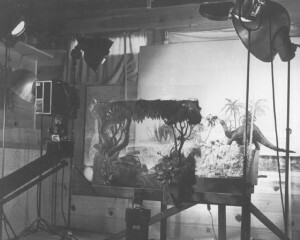 Kit West worked at matte and miniature photography. 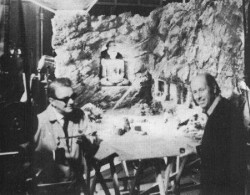 Hary Harryhausen and Les Bowie with one of the miniatures. 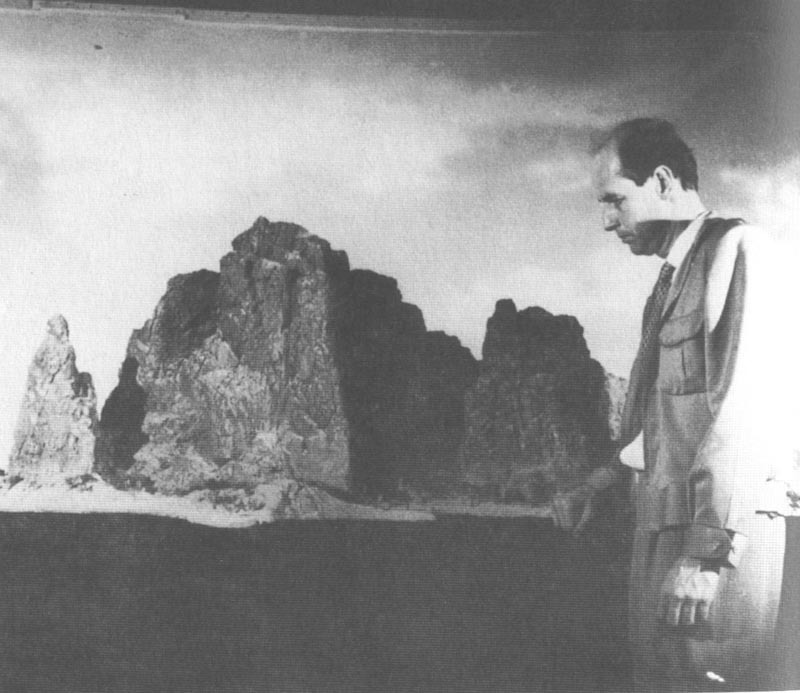 One of Les Bowie artist giving the last brush strokes to the Earth model, in front of a tabletop miniature. 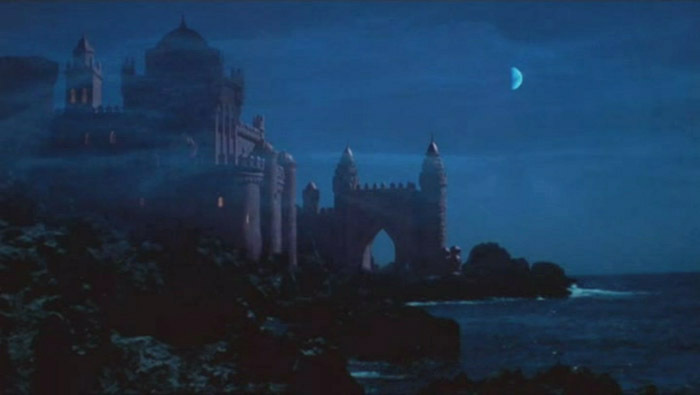 Les Bowie company was in charge of matte painting and miniature FX with Ray Caple and Bob Cuff painting. 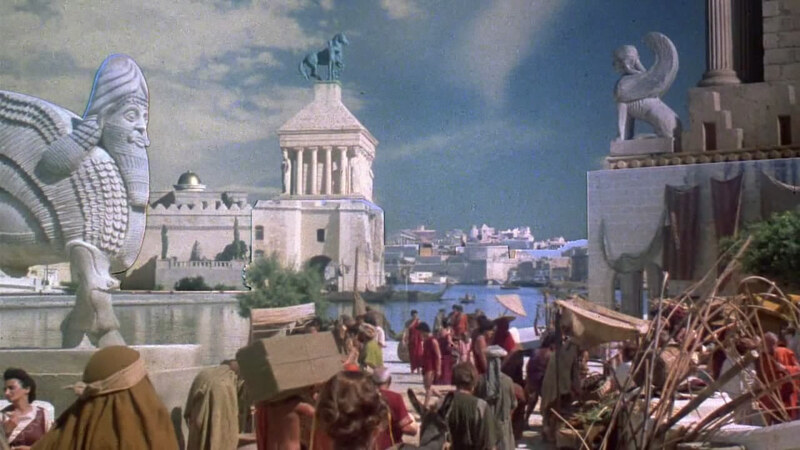 This time it was again Shepperton matte department in charge of matte paintings with Doug Ferris and Gerald Larn paintings and John Grant at camera work. 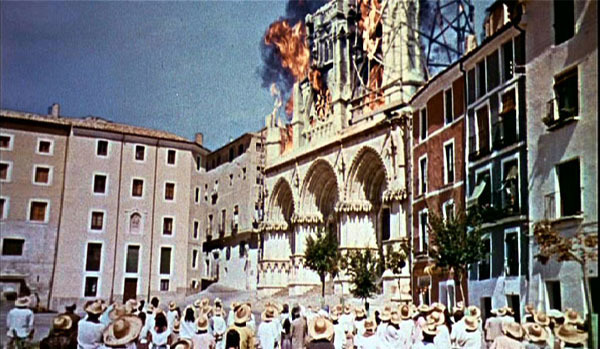 Some miniatures were done in Spain by Francisco Prosper, and some others in London by Shepperton FX crew. 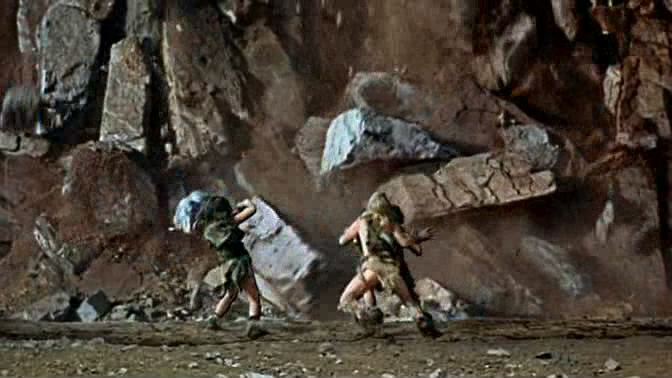 with some more gigantic rocks matte painted at the upper part of the shot. 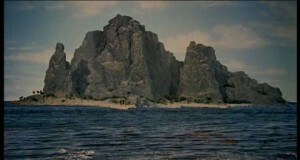 That matte painting was by Gerald Larn. 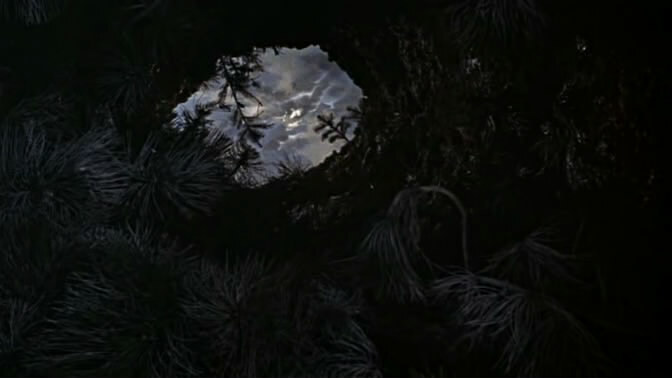 The others by Doug Ferris, both at Shepperton matte department. 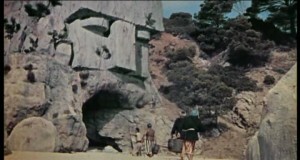 Special Make up: Colin Arthur. 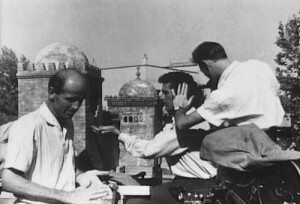 The travelling mattes were done at London under Vic Margutti supervision. 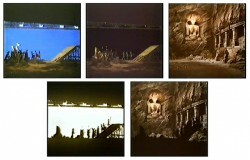 Some other miniatures that were matted at Postproduction. Emilio Ruiz del Rio and Ray Harryhausen with one of Emilio´s “on location” glass shots for the city of Marabia. 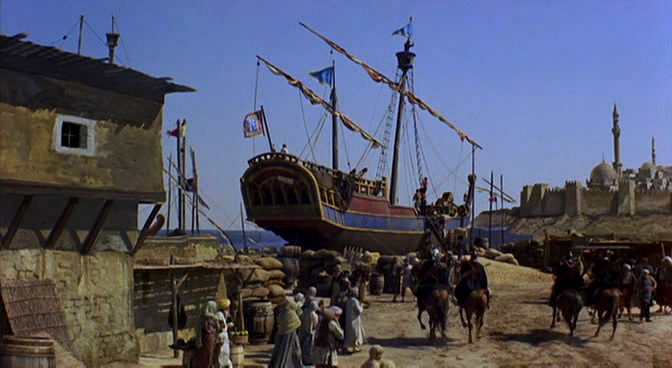 Another Emilio Ruiz del Rio´s cut out painted miniature of the city, mounted in front of the camera with the full-size set of Sinbad´s ship, built miles from the sea at the Verona Studios, near Madrid in Spain. 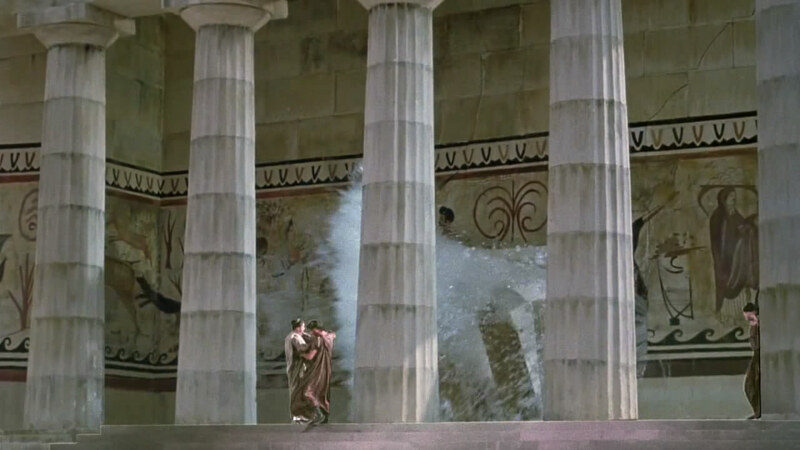 The painting was on two cut out aluminum pieces. The city at right and some buildings at left. 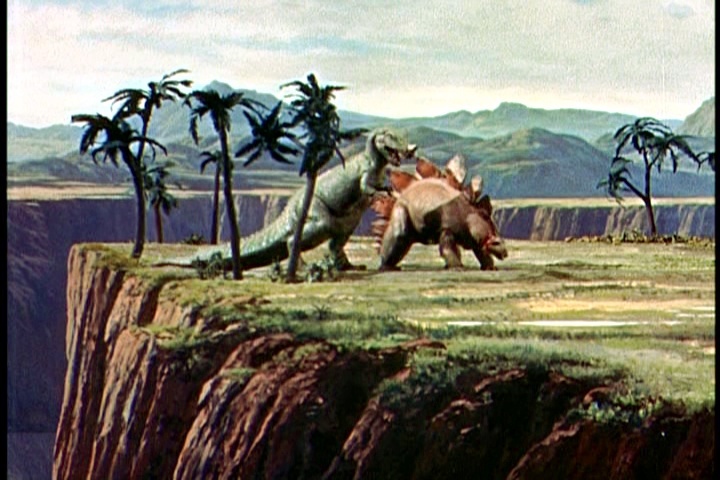 Based on a story by Ray Harryhausen. 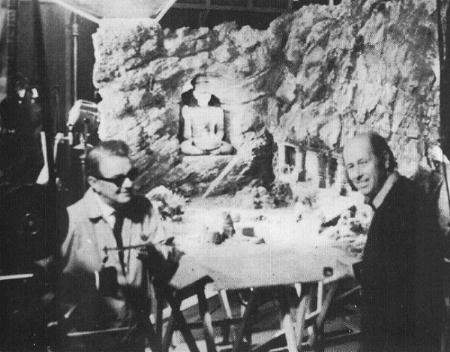 Les Bowie helped Harryhausen on building some miniatures that were matted in during postproduction. 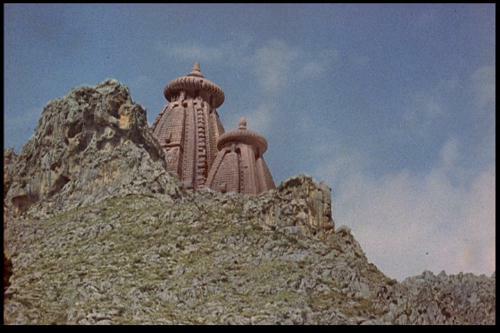 “The shots of the city of Charak were not, as some people believe, paintings. 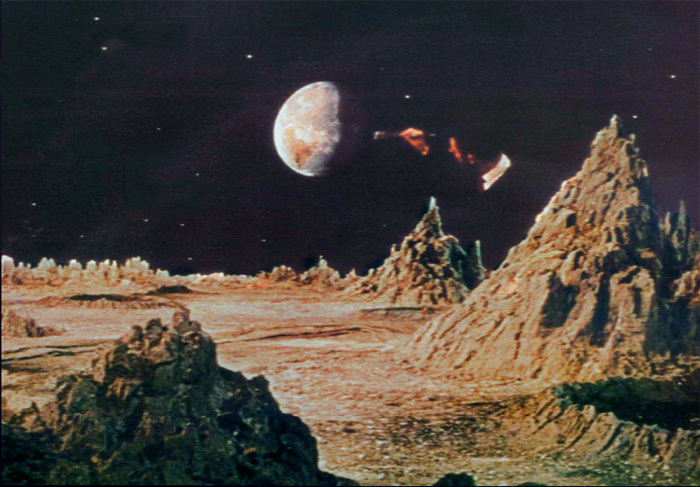 For some reason, I produced all these shots myself using real locations and making composites that included models”. Ray and Charles Schneer with some miniatures from the film. 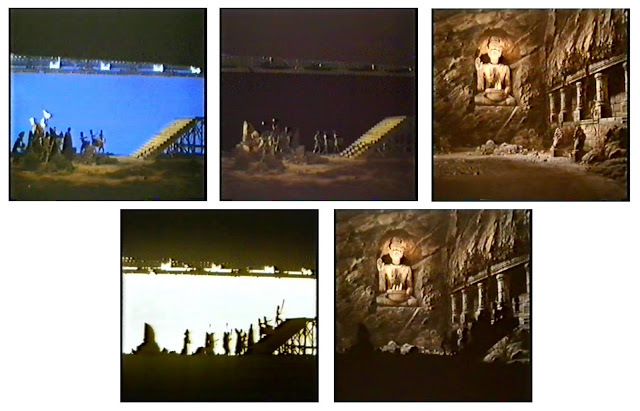 There are some reused matte paintings and some other miniatures probably by Les Bowie. Strangely there is a reused matte painting from another film. 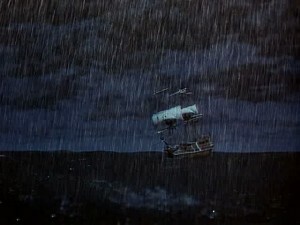 “Scott of the Antarctic” (1948) The original matte was painted by Geoffrey Dickinson. Animation legend Ray Harryhausen with the miniature city of Argos, with a painted backing behind him. The miniature city and the painted backing composited with the real sea. 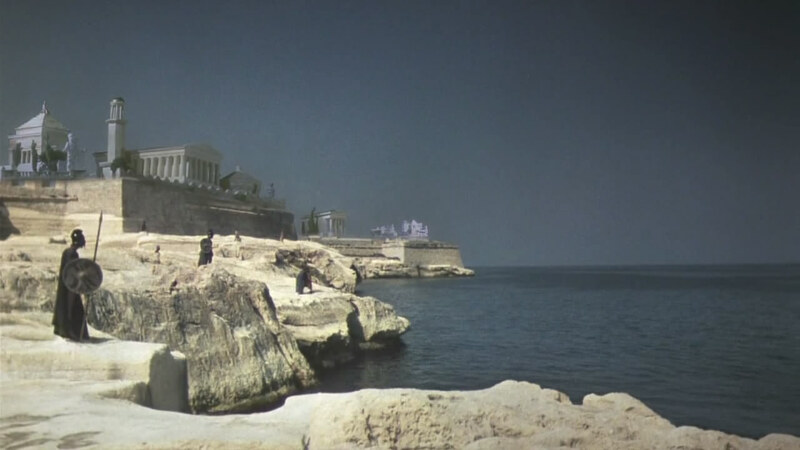 Real location in Malta with miniatures matted in. 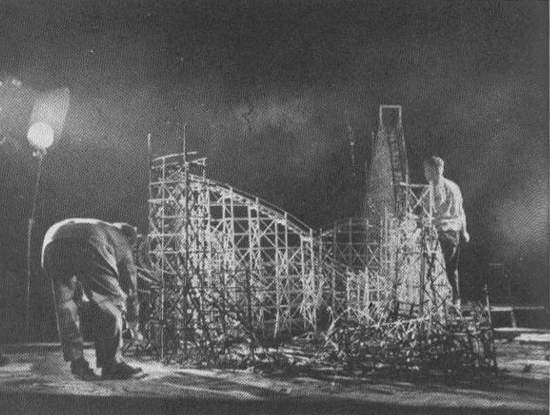 “This image shows the crew preparing the model prior to the tidal wave. 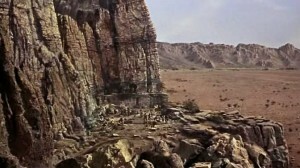 You can just see on the right-hand side of the photo the two ‘tip tanks’ and the chute that the water travelled down. 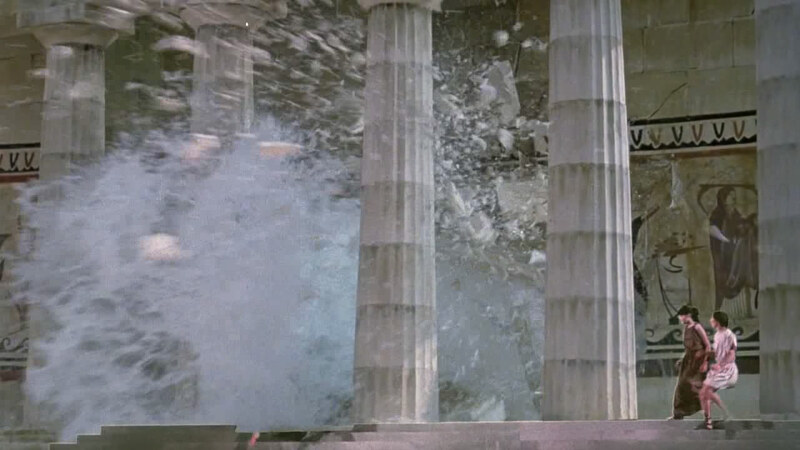 “Most of the miniatures were breakaways, right down to the columns and the temple facade were made in Cliff’s workshops. 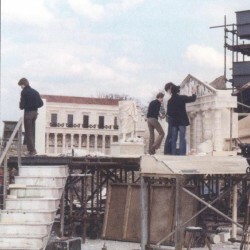 I remember that one of my jobs was making all the roof tiles for the main building. 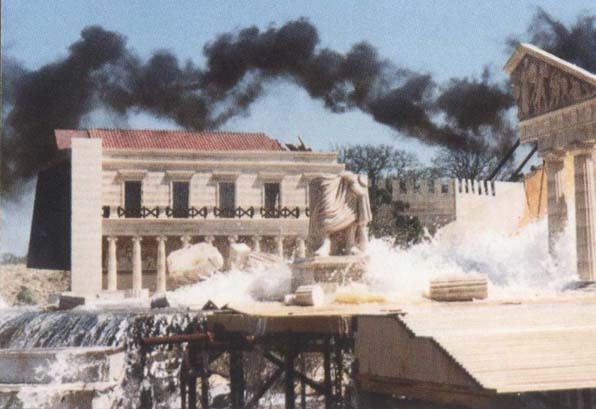 These had to be made separately so that some would fall off when the water hit the buildings. 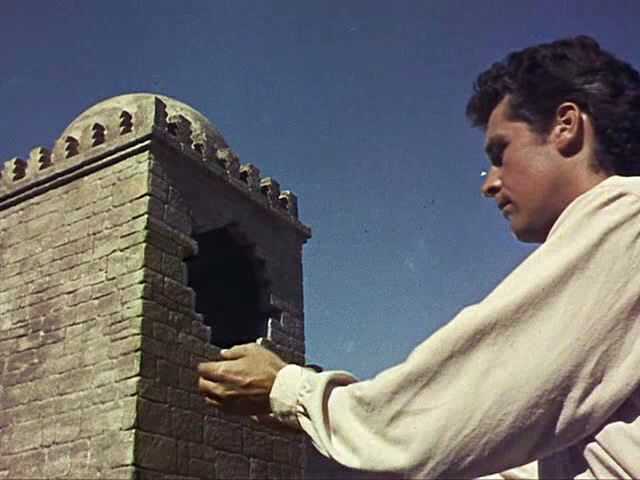 The buildings were made of various materials ranging from wood, plaster, and rubber. 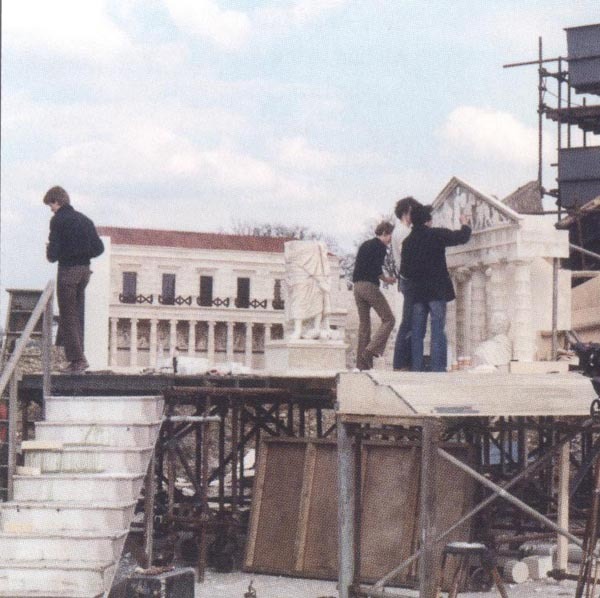 I also remember setting this shot one weekend when it poured down with rain all the time, but come the Monday when we shot it, as you can see the sun shone.” Terry Adlam. 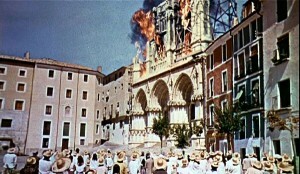 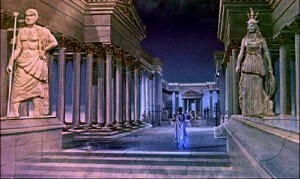 The actors were filmed in front of a blue screen and composited latter into the miniature by Roy Field. 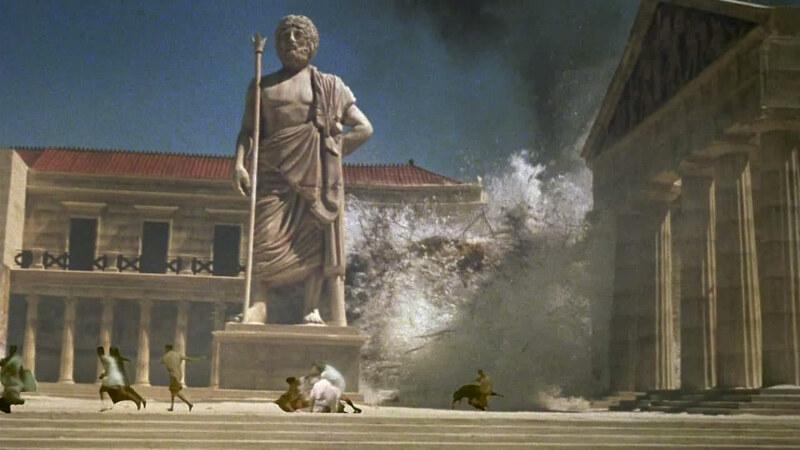 Some other images showing miniatures composited with live action elements. The third one is a miniature of the Mount Olympus. 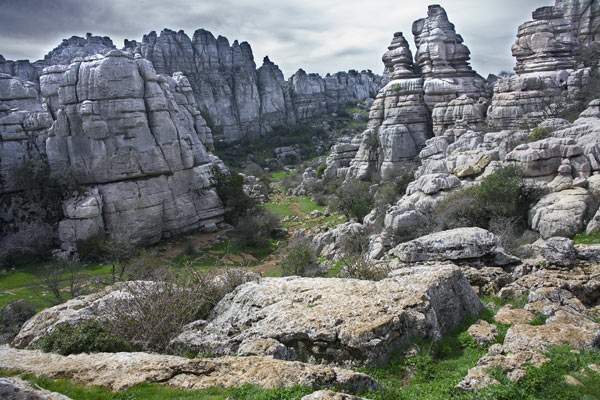 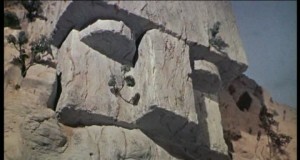 Filmed on the Spanish Location of El Torcal de Antequera, the same miniature was matted in from different angles. 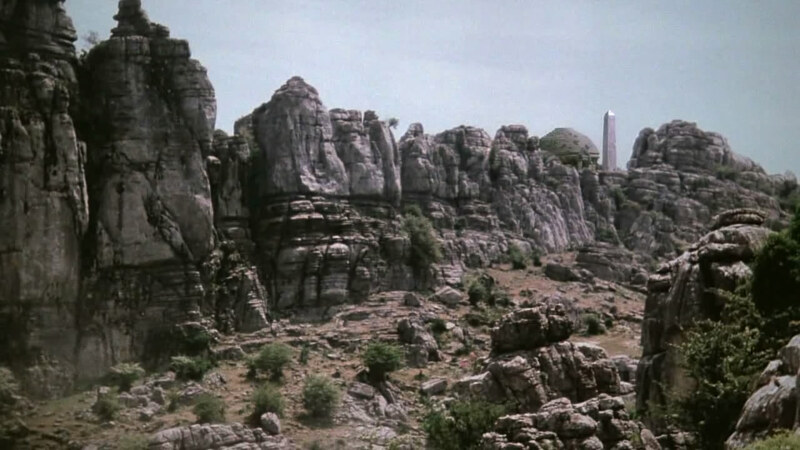 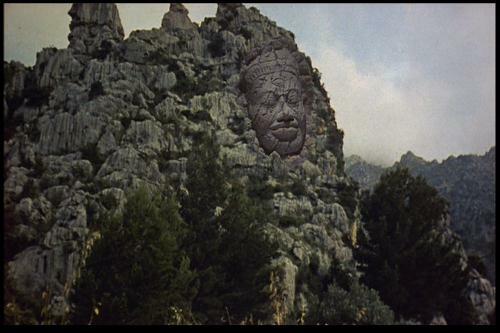 The last image is the real location, where some other movies were filmed like “The Deserter” (1971) with also Cliff Culley matte paintings. 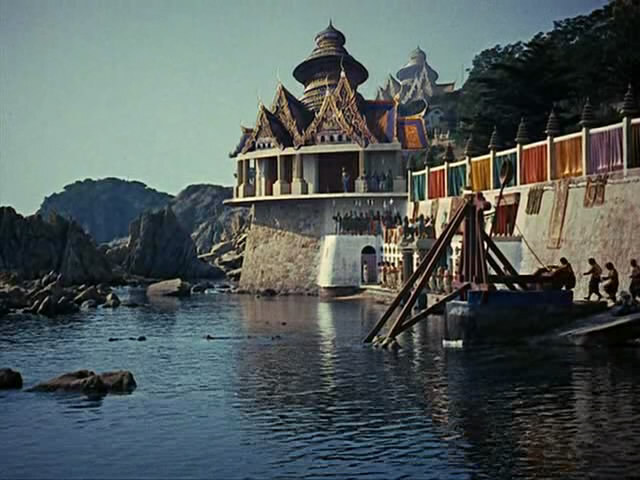 The left side if the island was a matte painting addition with a temple. 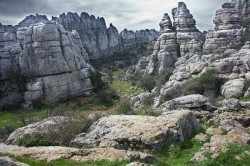 Ray add fog effect at postproduction to improve the composition. 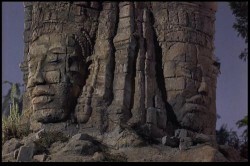 Posted on 30 January, 2014 by Domingo Lizcano. Permanent link.